I love the hexagon shell, so cute! Since this was my first plushy/amigurumi crochet project, it was a bit of a challenge. Someone with more experience doing this type of project would probably have an easier time. But it was still fun to make, and I was grateful for the opportunity to step outside my crochet comfort zone. For those who are new to this, I have simplified a few of the instruction, so that it is much easier to work. (At least for me). I also made the eyes bigger and more cutesy. I liked them better than the slit pupils that the original pattern had. These are the changes I made the the pattern. 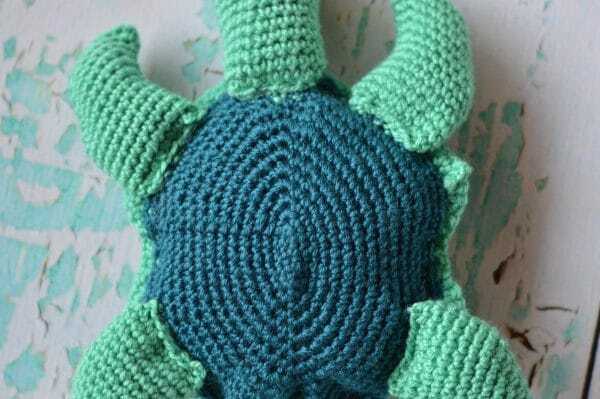 Follow the rest of the original pattern for your completed sea turtle. Ch 18. Join with sl st to first ch to form a ring, taking care not to twist ch. 1. – 5. Ch 1. Sc in same st. Sc all around the ring (18 sts). Join with sl st.
6. Ch 1. Sc in same st. (Sc 2 in next st. Sc in each of next 7 sts) work twice. Sc in last st. (20 sts) Join with sl st to first st.
7. – 8.Ch 1. Sc in same st. Sc in each st around. (20 sts) Join with sl st to first sc. Ch 18. Join with sl st to first ch to form a ring, taking care not to twist the the ch. Fasten off after 13th rounds leaving a long tail. Turn Leg inside-out. Fold leg flat and sl st along 13 row, sewing the end shut. Turn leg right-side out and stuff with Polyfil. 1. Sc 4 into ring. I also found it was easier to sew the belly to the shell if you pinned it in place. Be sure to stretch it a bit so it reaches out the 2nd color yarn. (Sew it in place with the 2nd color yarn). I also found that the starting point in the PDF was incorrect! Go down to the corner just below. The dc3tog should be worked in the valley between the two hexagons. I also found it was easiest to pinch the ends of the feet and neck closed before sewing them. It’s amazing the size difference between the cotton and acrylic! This little guy (made with acrylic) fits on Finny’s shell. 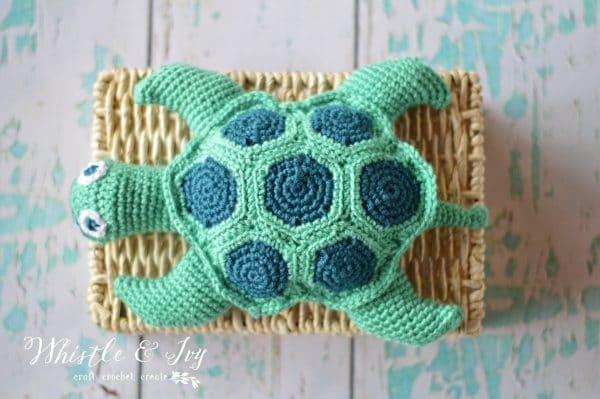 The Boy loves his crochet sea turtle! He named him “Finny,” which is pretty darn cute. And even though his neck is stretched out already from being swung around, I am so happy The Boy loves his new friend. 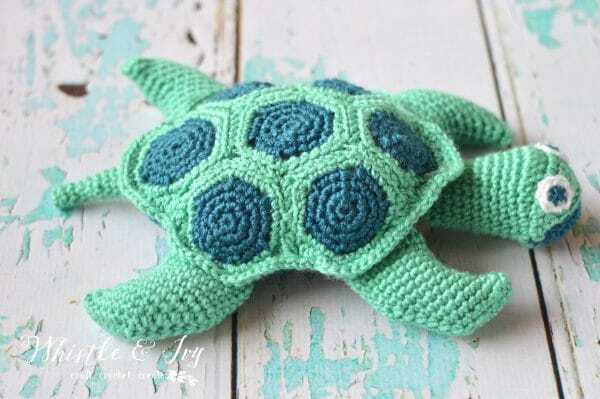 Like this crochet sea turtle? Subscribe! Join our Crochet Community on Facebook. We need YOU! I cannot seem to find the original pattern. Joann says it is not there. Is there another way to access it. I am so sorry, I have been in contact with them and they couldn’t find a copy in their archives or folders, it as been deleted! I will have to try and backward engineer the finished piece so readers can have access to the full pattern. I am so sorry for this inconvenience! Can you tell me how big this turtle ends up being? It was about 12″ long, but like I said in the post, it’s size completely depends on your yarn, hook and gauge. 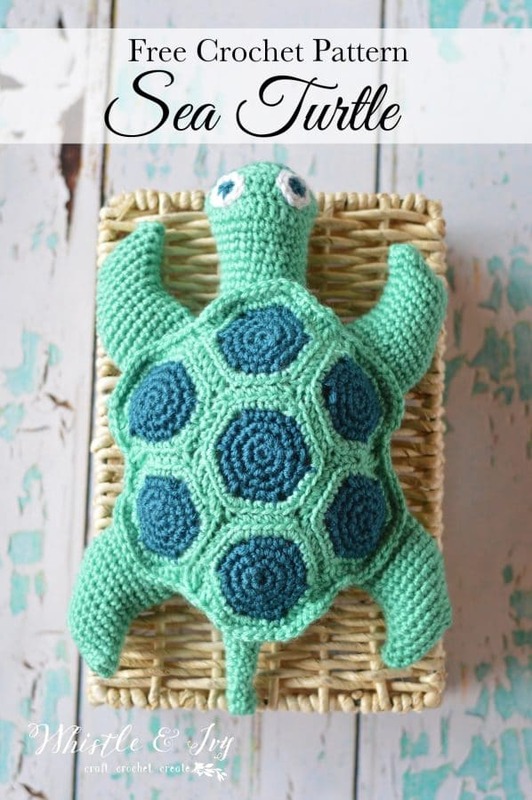 Your Sea Turtle pattern is adorable! I love it and I’m putting it on my to do list. Thank you for adding your changes to the original pattern. BTW, and just for your info – tortoises dwell on land, while turtles live in the water some or nearly all of the time. I am working on getting this pattern reworked! Bear with me. Do you perhaps have a pattern now that encompasses changes so that no “clicking over” is involved so that no mistake can be made? Thanks! I do not. That pattern is owned by Joann, and so it would not be legal for me to put it on my site. The entire pattern is at Joann, I simply added some ideas on making it work up simpler. This whole thing needs to be redone, to be honest. It’s on my list! 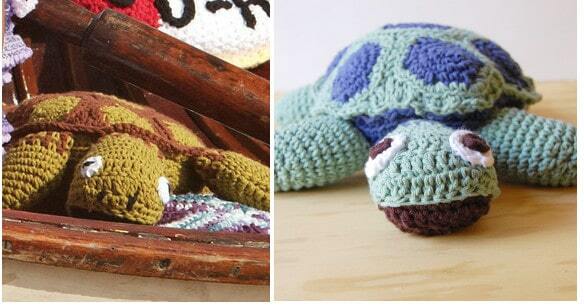 Your sea turtle is so cute and 4 grandchildren really want one each but I am having trouble with the legs. Perhaps it has been too many years since I did much crocheting. From the 2nd row on it directs me to ch 1 ;(which would be considered a sc 1 on the next row;) and sc 1 or sc2 in the following row (increasing the number or stitches each row). If the ch 1 or the sc 1 and 2 are not to be extra stitches what are they to be considered? By the time I’ve reached row 13, I have 30sc’s even though I have skipped some stitches and I’m on my 6th foot. I hope you realize how important this is to the grandchildren. From what the direction indicate each row should contain 18 sca. Needless to say, I’m lost and any help would be greatly appreciated. Yes, I am working the 2 decreases but I am no longer counting the chain at the beginning of a row as a stitch to enter a sc into it in the following row. I finally made one that looks good. Thank you for trying to help me. Where is the pattern for the shell? And how to connect it all?? These are my tips for completing a pattern at Joann.com. The second photo compares mine with theirs. The link is at the top of the post. I was wondering how i would make it so that there was no mouth. I want to make it so the head is just one color. Should I just do all the parts in one color, or what? That would definitely be the easiest way, without having to alter the pattern. Hi, Bethany! I made 2 of your patterns and they are so cute. The turtle is so adorable. One friend ask me to make it for her child. 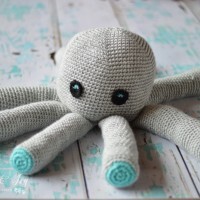 I am sure it will be very difficult for me to make it as I am not good in crocheting but I will give a try. I am not clear with the directions on joann.com. Can you help me? What is this: GAUGE: 15 sc and 16 rows = 4″ ? The hexagons look difficult. I want to be clear how to start. Thank you in advance! This project is adorable! 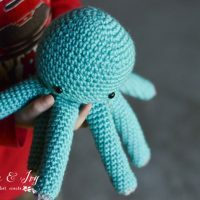 Would the belly pattern on the other site still work out for this project? Yes! I only changed the legs and neck. Hi! I am having a super hard time making the head you posted. Could you please help me? Oh dear. I just checked and I see there may be a miscount! Let me see if I can check it and see what’s going on. Sorry! I think I have everything fixed. Sorry for the inconvenience! Hello again! Now I am having trouble connecting the hexagons! I’m just not sure what they mean by connecting them. Could you explain it better? I’m feeling so confused! So its saying place two hexagons right sides together. From here, you will work in the back loops only, but because you are looking at the wrong side, it will be the loop facing you, and the loop on the other side (so don’t work thru the 2 middle loops). Does that make sense? I understand that much, but I’m not sure how to connect the two hexagons. Or how I’m suppose to make the shell around them. Hm. Can you be a bit more specific about your question then? I guess I am not sure how to explain it. You work sc through the two outside loops and that connects them… Are you clicking over to the original pattern? The notations on this page are just my alterations to the original pattern on Joann.com. This is definitely a project that I am going to make soon!! So cute. And thanks for the link to the original pattern. Never knew that site existed. Oh my gosh this is super cute. I am definitely going to have to make one or four in the TMNT colors. Thank you for sharing this at my link party Tea party Tuesdays. I hope to see you again next week. Thanks, Winnie! You should take it up again! Thanks so much for adding this post to my Wonderful Wednesday Blog Hop on Ducks ‘n a Row. Please do come back again next week! 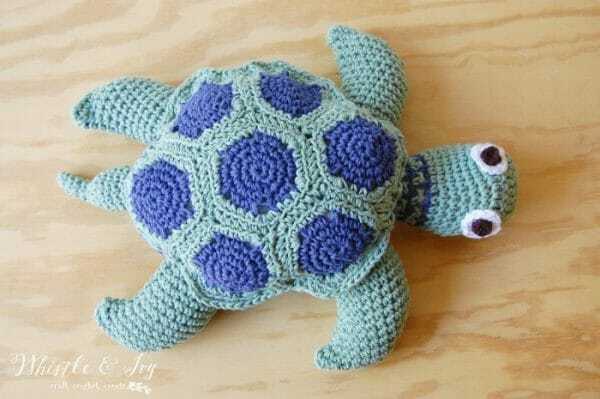 Cute turtle!!! Thanks for sharing @ Submarine Sunday! I’m definitely pinning this for later. Found you on the Daisy Cottage linkup! Thanks for stopping by, so glad you like it! This is awesome! Thanks for sharing the pattern! I’m so in love with your Turtle!!! It’s so cute!!! It would be so cool if you could join my Link Party on Sundays (it’s live now, until tomorrow midnight) and the Pin Hop on Thursdays if you would like to make some new friends =D. This guy is super cute! We’d love for you to share this over at Much Ado About Monday, if you get a chance. Oh my gosh that little guy is adorable! Found you over on Tumble Weed Contessa’s linky party. My girls would love, love this! It is so cute! I hope you will share this on my blog this week. The challenge is “Life at the Beach” challenge. Anything beach/summer inspired or nautical. I will definitely come by, thanks for the invite! OMG, this is SO CUTE!! It makes me wish I could crochet. :) Thanks for stopping by EndlesslyInspired.com! Thanks so much, Jenn! You should learn! Thanks, Cat! I actually have wanted to learn how to knit, all those loops look intimidating though! So dar cute! I never did learn to crochet, but it’s never too late. 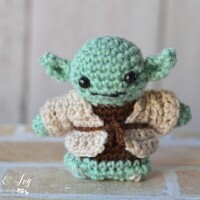 Knowing I can’t crochet to save my booty I’d actually pay you to make one for me. LOL These are so cute! I love that shade of blue on the little guy.